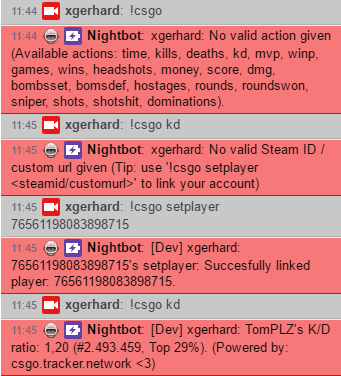 Please dont change any variables in the command, just copy paste this command in your chat. [Dev] xgerhard: TomPLZ's K/D ratio: 1,20 (#2.493.459, Top 29%). [Dev] xgerhard: ZWR's hours played: 1.183.212 (No rank, Top 24%). Use the last part of your Steam URL, just the ID or custom URL part. Links will probably result in timeouts.